Dozens of new iPhone apps are released every day, so the good ones can be hard to find in the constant stream of releases. 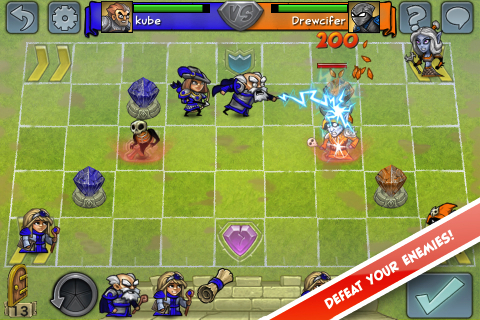 Developed by Robot Entertainment, Hero Academy is a turn-based strategy game for iPhone with a cartoonish style. 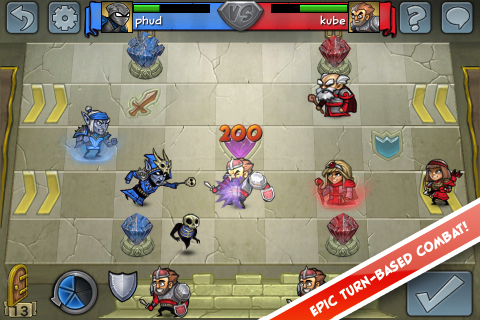 On the surface, the gameplay is reminiscent of Heroes of Might and Magic, without the overland map, and the cartoon avatars and chessboard-like maps are reminiscent of Japanese RPGs in the 90s. Hero Academy is a free iPhone application. It requires iOS 4.1 or later, and it can also be played on your iPod touch. For this review, we played it on an iPhone 4S, and enjoyed it a lot, although we’re sure that the application would benefit from being able to “breathe” on the larger iPad screen. Hero Academy has both a single-player and multi-player mode, and each of these modes feel quite different. While the AI in this app is not particularly mature yet, each single-player map feels like a puzzle board. In other words, you’re using your wits to overcome a situation rather than compete against an opponent, so the raw gameplay style fits the game well. In the multiplayer mode, the game feels more like you’d expect it to be from the premise. Unfortunately, there are some strange design decisions, like STOMP and other powerful moves, which add a lot of luck to the experience. That’s not to say that Hero Academy isn’t fun, because it really is. However, a greater level of predictability and strategy would make this game far more engrossing, and provide it with much more replay value. As it is, Hero Academy is a fun introduction to the TBS genre, and since the app is free, it is certainly worth playing through at least once. In fact, it’s a particularly great fit for the younger audience. The gameplay and the units are all rather simple, and kids will be able to run with it without much adult interaction. If you’re a more sophisticated gamer, especially if you’re a fan of this genre, then you might wish for a slightly more sophisticated Hero Academy. However, earlier we mentioned puzzle games, and if you approach Hero Academy as such, then there’s a lot of fun to be had here. It’s certainly good enough to kill time on the commute home, and the unpredictability of the AI and various moves ensures that the puzzle is different each time. In multiplayer, however, there’s just too much randomness and inconsistency for it to be a rewarding experience long term. The bottom line of this review is that you can’t beat free, and the cost here overcomes any shortcomings. The cartoon graphics are very crisp and clear, and they look great on the smaller screens used by the iPhone and iPod touch. We’ll certainly be keeping this iPhone app installed, and we look forward to seeing how the board looks on the larger iPad screen. AppSafari review of Hero Academy was written by Joe Seifi on March 6th, 2012 and categorized under App Store, Featured, Free, Games, RPG, Strategy. Page viewed 3821 times, 1 so far today. Need help on using these apps? Please read the Help Page.